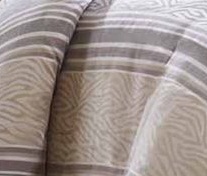 This is the perfect neutral colored bed that offers just a touch of trend through a Zebra jacquard weave subtly woven into a classic stripe. The decorative pillows add a little extra splash through special embroidery and piecing techiniques. Available in Queen and King. Material Detail: Duvet & Sham: 100% polyester jacquard, 100% polyester microfiber back; Square Pillow 18×18”: 100% polyester polyoni cover with embroidery on face, poly fill; Square Pillow 16×16”: 100% polyester polyoni cover with piping on face, poly fill; Oblong Pillow 12×18”: 100% polyester polyoni cover with embroidery on face, poly fill.